Regardless of what you think about elves uniting, I'm wondering what is generally considered the "top tier" combined elf list using all three armies. There's so many options I don't even know where to start, lots of directions to go. Elf shooting army is far more viable now, you monster mash might be worth a try, lots of elite infantry to choose from, and of course an avoidance character heavy list is even better now, especially for high elves since we can now take sisters of thorn/warlocks. As you said, there are a wide range of really competitive options, and I don't think there is one clear top-tier list. Personally I think the strongest armies are built around Alarielle: Avatar of Isha and plenty of darkshards. I've heard plenty of others argue that Malekith the Eternity King is the obvious centrepoint of a top-tier list, and others who are packing masses of cavalry . I know its considered weird to praise GW right now but I really like how they have shaken the game up so dramatically yet still left such a wide range of competitive options with no clear number one. I think its too soon after the new rules for the meta to have settled down and for the most popular lists to become established. So I'd say try out some different combinations with the new rules and see what works for you. 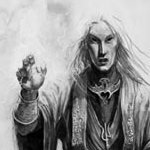 Check out the Army Lists section of ulthuan.net if you want for more detailed examples and discussion of competitive mixed Elf armies. I did try Alarielle as avatar of life, loved using her since she's not uber expensive like Malekith yet still does a lot. Either version of her is good though. Lots of cavalry isn't surprising, with dark riders, wild riders, glade riders, silver helms, warlocks and sisters of thorn all being in the same list that's a given. I agree though it's too early for a "netlist" if one is even formed at all. Difficult question to answer. I'm not sure on your meta but I know mine definitely won't be using ET characters any time soon. There is, however, a big drawback to this: the different options all depend on one or more big SC/centerpieces. For me that's a very limiting restriction. But that's not really now nor here. In my own experience, the name of the game for elves still is mobility. Alarielle, being an infantry model, means you are going to play mostly defensive or reactive in a meta full of fast, killy über-characters and flying monsters. Malekith, on the other side, is a powerful model that also synergizes with faster, aggressive approaches. Malekith is awesome and works well with a mobile elf army, however I do think one of the big named characters are not necessarily needed. It is a massive pts sink and you could run much cheaper characters and still get good magic access. That ultimate list will probably have to evolve as there were not many opportunities to field these yet (I presume not many tournament organizers decided to allow ET army lists yet). However, I spotted this on another forum. It was used by one of the players in US (I think he comes from MA region and he finished 5th at US Masters 2014). It might give you an example what can be done. Let's say roughly 2500-3k, normal magic rules, no comp and normal battle. Comp hasn't even caught up to Khaine yet anyway, I can't imagine they'll allow the list in comps like ETC. @Swordmaster of Hoeth: I spend a fair amount of time on cotec which is where I saw that list, I've seen a fair number of his WoC lists which are great so he clearly knows his stuff, however can't see myself running that sort of list-I barely play my dwarf army because shooting is boring and that's what that list is all about. I don't like it either. The guy himself didn't like it, so what does it tell you? but I guess this is what people go for these days, magic, shooting, cavalry, flying heroes. I think you might want to coin your own definition of "ultimate" here as it is obvious it may mean different things to other players. 2500 and 3000 points are two -very- different ballparks. Even without the grand army rules those 500 points make a huge difference. At 2500 uncomped I'd say Teclis light coven is about the best we can do, backed up by all the nastiness from the multiple books. I'm not sure I'm a fan of spamming RBTs as I believe Wood Elf shooting is often superior (doubly so when they can fire in 3 ranks). However Malekith + infantry builds are also very, very strong: You can't argue with his innate WBW. It boils down to a rock-paper-scissors scenario though: Karl Franz will likely smash said Teclis list but in turn gets completely destroyed by Malekith and Malekith doesn't like the Teclis list (come to think of it: Teclis cannot be taken with the Host of the Eternity King so that kind of reduces your options). There are, of course, multiple really broken ways to go. In a vacuum, no optimal list exists without knowing the meta, as they are inevitably eachother's counters.